THE INSTANT NEW YORK TIMES BESTSELLER! 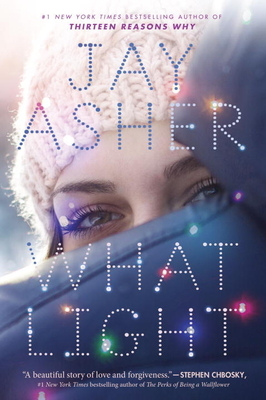 From Jay Asher, #1 New York Times bestselling author of Thirteen Reasons Why, comes a holiday romance that will break your heart, but soon have you believing in love again. . . .
"A beautiful story of love and forgiveness." Sierra's family runs a Christmas tree farm in Oregon—it's a bucolic setting for a girl to grow up in, except that every year, they pack up and move to California to set up their Christmas tree lot for the season. So Sierra lives two lives: her life in Oregon and her life at Christmas. And leaving one always means missing the other. By reputation, Caleb is not your perfect guy: years ago, he made an enormous mistake and has been paying for it ever since. But Sierra sees beyond Caleb's past and becomes determined to help him find forgiveness and, maybe, redemption. As disapproval, misconceptions, and suspicions swirl around them, Caleb and Sierra discover the one thing that transcends all else: true love. What Light is a love story that's moving and life-affirming and completely unforgettable. JAY ASHER's debut novel, Thirteen Reasons Why, a #1 New York Times and international bestseller, has sold over 3 million copies in the United States alone and is now a thirteen-part series on Netflix. The Future of Us, his second novel, was co-authored with Printz Honor winner Carolyn Mackler. He is also the author of the New York Times bestselling What Light. Piper, out in Fall 2017 and co-authored with Jessica Freeburg and illustrated by Jeff Stokely, will mark Asher’s graphic novel debut. His novels have been translated into thirty-seven languages. He lives with his family in California. Follow him on Twitter @jayasherguy. "Asher has done it again. He gets into the heart of what is important in relationships, whether friendship or romance, and his characters are realistic and well developed. Teens will see themselves in these characters, and relate to them." "Certain to please readers seeking an escapist, feel-good holiday read. Asher’s follow-up to his best-selling debut is destined for lots of attention." "This is a sweet, light romance, perfect for holiday reading." "Charming and sweet, Sierra and Caleb’s budding relationship should suit readers looking for a wintertime romance that’s as cozy (and familiar) as candy canes and gingerbread during the holidays." "Asher is a dab hand at capturing everyday situations and conversations; Sierra and her friends tease and quip in ways that are witty but not overly so, and Sierra’s frank talks with her parents have the tone of a mature, beloved only child who is used to being heard even as her parents set the rules."